that will make systemic 'DUH' obsolete. while jobs continue their flight out of the country. not more jobs and higher wages." above the rights “of, by and for the people”? 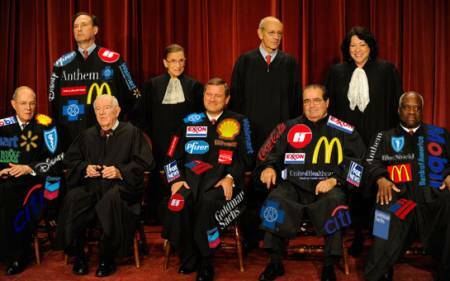 It only took 5 of the 9 Supreme Court Justices to overrule U.S. Constitutional Law. in the crucial closing weeks." Look what has happened to Constitutional Law since Obama became President. at the expense of mainstream America and social services. I care not who makes the laws." for the reconstruction of major banks during the financial crisis." was the cause of all these evils." with his “Lincoln Greenbacks’, and was assassinated. the midst of war. God grant that my suspicions may prove groundless." On infiltration instead of invasion. On subversion instead of elections. I must inform the citizen of this plight." on Nov. 12, 1963, ten days before his assassination. was Rep. James Traficant, Jr.
from a Sovereign in the guise of the Federal Reserve Bank. We the people have exchanged one master for another." for challenging the abuses of the Fed-financed corruption in Congress. written in a letter to the Secretary of the Treasury Albert Gallatin (1802). were independent farmers, shopkeepers or tradesmen. The concept of economic freedom was just common sense. Today, the vast majority of Americans are foot soldiers in the corporate armies. keeping it that way… a monopoly on self-serving power. they will trample all over your fallen liberties." about Congress, that "they will trample all over your fallen liberties." whereby an ounce of prevention is worth a pound of toxic drugs. its original high purpose of discovering and producing useful new drugs. including the US Congress, the FDA, academic medical centers, and the medical profession itself." which is just as pernicious and deadly as the chemo cancer racket and the endless war racket. he shepherds his flocks in the ways of utility and comfort." Remember when Obama began his massive ‘Health Care Reform’ after the bankster bailouts? Is it true that he promoted “Universal Health Care’ until he hit the wall of ‘insider’ resistance? that did NOT want to be removed as the middlemen for their big fraction of the action? the military-industrial complex in self-serving special interests? according to a law school dean who served as one of Obama's top transition advisers." using globalist ‘standards’ called “The Codex’ that evolved from Nazi standards out of Hitler’s Germany. It will eliminate many nutrition supplement companies to further consolidate the Big Pharma monopoly. by a sovereign system of representative self government under the Constitution. loss of both freedom and security. economics of scarcity - the oxymoronic value of scarcity - to an economics of abundance. for the profit, power and control of banksters who have usurped the Constitution with usury. The problem is not debt. The problem is not paper (or electronic money). enslaving us with interest. We are run by a banking cartel. Only by understanding money will we be liberated from the money cartel. there would be a Revolution before tomorrow morning." give it to the Treasury Department just as the Constitution intended. municipal taxes that go to pay interest to the privately owned 'Federal Reserve' Banksters. is the master of all its legislation and commerce." and agree that there can be no healing until this dis-ease is no longer denied and ignored. You will know the enemy by their own words. Their pride goes before their fall. and I am proud of it." "Regarding the Great Depression, you’re right, we did it." a [expletive deleted] piece of paper!" tried to organize a coup in the U.S. government. enemy within the gates or they will simply lose their lucrative jobs. An enemy at the gates is less formidable, for he is known and carries his banner openly. But the traitor moves amongst those within the gate freely, his sly whispers rustling through all the alleys, heard in the very halls of government itself. For the traitor appears not a traitor; he speaks in accents familiar to his victims, and he wears their face and their arguments, he appeals to the baseness that lies deep in the hearts of all men. He rots the soul of a nation, he works secretly and unknown in the night to undermine the pillars of the city, he infects the body politic so that it can no longer resist. Use the Internet while it is still relatively free and open. makes the existing model obsolete." promote intelligence and virtues among the People, as the best means of preserving our liberties." "There is a natural aristocracy among men. The grounds of this are virtue and talent." for which it stands -- what has happened once in six thousand years may never happen again. there will be anarchy throughout the world." or nature will do it brutally.